NEW YORK: China Petroleum & Chemical Corp (Sinopec), the nation's biggest oil refiner, and US buyout firm TPG have weighed a bid for bankrupt chemicals company LyondellBasell Industries AF that could challenge Reliance Industries Ltd's offer of about $12 billion, said two people familiar with the matter. Sinopec and TPG reviewed LyondellBasell's finances and discussed making a joint bid, said the people, who asked not to be identified because the negotiations are private. It was unclear whether one or both of the parties will proceed with an offer, and the sale process remains fluid, the people said. A buyer would gain US chemical assets that use natural gas as a raw material, which is cheaper than the oil-based ingredients mainly used in Europe and Asia, said Mark W. Connelly, an analyst at Sterne Agee & Leach Inc in New York. LyondellBasell collapsed less than two years after it was created in a $12.7 billion buyout led by billionaire Len Blavatnik's Access Industries Holdings. "It's a good company that had a bad balance sheet at the wrong part of the business cycle," Carl Blake, a Washington-based analyst at Gimme Credit LLC, said in a telephone interview. "It was over-leveraged and got caught in a commodity cycle that went to hell in a hand basket." Bonds of LyondellBasell's Arco Chemical Co unit climbed to an 18-month high on the news. Arco's $225 million of 9.8 percent senior secured bonds due in 2020 rose 2.5 cents to 83.5 cents on the dollar as of 4:23 pm yesterday, the highest since May 21, 2008, after gaining 8.875 cents the previous day, according to Trace, the bond-price reporting system of the Financial Industry Regulatory Authority. Any bids for Rotterdam-based LyondellBasell, which filed for bankruptcy in April, may compete against a reorganization plan including a rights offering backstopped by Access, Apollo Management LP and Los Angeles-based Ares Management LLC, the people said. TPG, the Fort Worth, Texas-based buyout firm founded by David Bonderman, made an earlier bid to backstop the offering that was rejected, the people said. Representatives at TPG, Access and Apollo declined to comment. 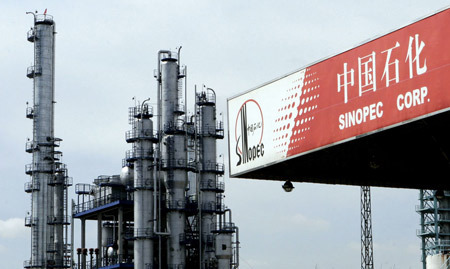 Sinopec's Beijing-based spokesman Huang Wensheng also declined to comment. Bill Mendel, an Ares spokesman, confirmed the investment firm is part of a group backstopping the rights offering. LyondellBasell is being advised by Evercore Partners Inc, according to a person familiar with the matter. An Evercore representative declined to comment. Reliance, the oil refiner and explorer controlled by Indian billionaire Mukesh Ambani, on Nov 21 said it offered an undisclosed amount of cash for a controlling stake in the company. Perella Weinberg Partners is advising Reliance on its bid and JPMorgan Chase & Co is helping arrange financing, according to people familiar with the matter. Officials at Perella Weinberg and JPMorgan declined to comment. Reliance spokesman Manoj Warrier declined to comment on its advisors or the value of its bid. LyondellBasell was formed in December 2007 when Basell AF bought Houston-based Lyondell Chemical Co. About 55 percent of sales last year were in North America and 38 percent in Europe. The company has $7.06 billion in bonds and loans maturing next year and an additional $20 billion due through 2027, data compiled by Bloomberg show. It is asking creditors to forgo about $18 billion of that under the reorganization plan filed with a US court, Somshankar Sinha and Vikash Jain, analysts at CLSA Asia-Pacific Markets, said in a note.